Please use this order form if you wish to pay cash or an e-transfer. before submitting your order or you will lose your information. To ensure that you receive your correct order please complete all contact information and click submit at the bottom of page. 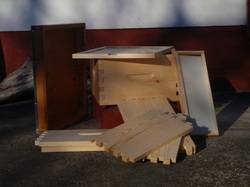 Unassembled 9 5/8" hive body, commercial grade. Constructed in Canada from sturdy white pine. Unassembled 6 5/8" hive body, commercial grade. Constructed of sturdy white pine. 10 frame telescoping metal hive cover - waxed dipped. 10 frame wooden inner cover. This well-built IPM screened bottom board makes hive management easy. Features include easy to clean removable mite board with easy access from the front or back, smoke hole and rain guard. Finished with a non-toxic paraffin/tree rosin solution. Need an entrance reducer? See Country Rubes Entrance Reducer. Fits snugly in the hive entrance to control the size of the opening. Perfe﻿﻿ct for swarm catching, temporarily holding splits, or raising queens. This four frame nuc is lightweight and durable enough to be reused. 8 1/2 " size Perma-Dent snap in waxed foundation. For use in 9 1/8" size frames. Available in Black for $1.65/each. 5 5/8" Perma-Dent snap in waxed foundation. For use in 6 1/4" size frames. 8 1/2" Beeswax and wired foundation. For use in 9 1/8" frames. 5 5/8" Beeswax and wired foundation. For use in 6 1/4" frames. One piece plastic frame and foundation has a larger cell pattern, encouraging drone comb. For use as a part of your IPM for Varroa mites. Once the cells have been capped, place in the freezer for 48 hours. Then let warm to room temperature and uncap cells with a uncapping scrapper. Place frame back in the hive for the workers to clean out the dead drones and mites. Reusable. Dadant 4" x 7" Smoker - Stainless steel smoker with shield sturdily built to give years of corrosion free use. The bellows are designed to create the best volume of cool smoke. A soft bristled brush designed to be gentle enough to sweep bees off frames, super, or clothing without crushing or injurying them. A sturdy wooden handle. Can be washed. 11" Frame lifter and scraper. Hooked end is used for prying frames, the opposite end works great for scraping. Perfect for pulling out those hard to get at frames and checking both sides of the frames with ease. A metal grid that fits between your brood boxes and honey supers. The spaces are large enough for the workers to pass through but too small for the queen, keeping her out of your honey. Durable and corrosion proof. Metal grid surrounded by wood for a perfect fit between your brood boxes and honey supers. The spaces are large enough for the workers to pass through but too small for the queen, keeping her out of your honey. Durable and corrosion proof. 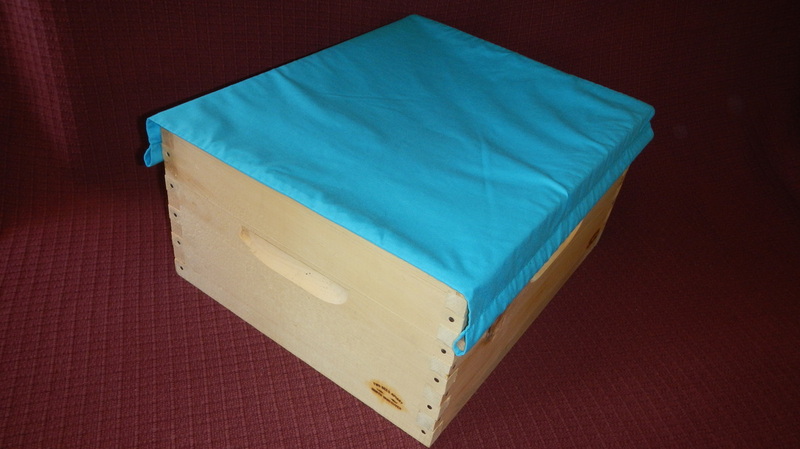 Put this amazing cloth cover on top of your frames when opening the hive. Assists in keeping the bees down and inside the hive. Makes it easier to move and pull frames. Keeps the light out and the heat in! Nails for Hive Bodies. 2 1/2" x 12 gauge coated flathead nails for hive bodies. Approximately 150 per pound. Priced per pound. Nails 1 1/4 x 17 gauge coated flathead nails for frames. Approximately 550 nails per half pound, Priced per half pound. Nails 7/8 x 18 gauge coated flathead nails for frames and frame rests. Approximately 1100 nails per pound. Priced per half pound. Fits in the entrance of your hive or can be put on top in an empty super, holds a standard quart sealer jar. Good for smaller quantities of syrup feedings, not best for cold weather feeding. Standard Pollen Patties. Consists of sugar, soy, yeast, water and 25% pollen. Priced per pound 1 pound patty..
5 gallon pail, BPA free food grade with heavy duty plastic honey gate and lid. Ideal for ease of extracting. Three reusable, hand washable filters with a rolled rim to keep it in position on a pail. The 3 filter system is coarse screen (600 microns), medium screen, (400 microns), and fine screen (200 microns). For wonderful filtered honey, use this solidly constructed, double screen system to filter out debris. 1 1/2" Honey Gate - Fits in 2" hole. This non-electric serrated edged knife is a great way to uncap your honey. Use by immersing in boiling water, and slicing through the cappings. This uncapping knife has a built in thermostat with a pre-set temperature of 260F-270F. Wooden handle stays cool. Blade is 10" long and 2" wide. Great size for samples or gifts. Lids not included - 43 mm opening. Hexagon shaped jars. Lids not included - 48 mm opening. 12 per case - Priced per case. Oval Hex shaped jars. Lids not included - 58 mm opening. 43 mm Gold - 24 per package. 48 mm Gold - 12 per package. 58 mm Honey Comb Pattern - 12 per package. 70 mm Honey Comb Pattern - 12 per package. 82 mm Honey Comb Pattern - 12 per package. 58 mm Bee with Pink Flower - 12 per package. 70 mm Bee with Pink Flower - 12 per package. Handy tag with nutrition information. Room for labels, fits all sizes of jars. 41 st Addition. Hard Cover, 911 pages. Over 1000 photos and honey bee information. Written and edited by Dr. Hachiro Shimanuki, retired research leader from the USDA. Soft Cover, 164 pages. A great beginners guide as well as helpful tidbits for the long time beekeepers. Full color photos taking you from Bee behaviour, the hive and it's products. Fun tips of candle making and recipes too. Author Kim Flottum is editor of Bee Culture Magazine. Educational poster showing the life cycle of the Queen, Worker, and Drones. Frame not included. Well Crafted wooden honey dipper. Quality cotton and polyester blend veil. Has a fencing style veil Handy for guests or quick hive checks. One size fits most. Goat skin gloves with full length gauntlets. Available in Small, Medium and Large.